It was good to learn that the shamefully desecrated Spencer’s Tomb is being restored as part of the House of Four Winds project and that St Roque’s chapel on St Michael’s Counterguard is being rebuilt. These works will see the reinstatement of two little-known historic landmarks in Valletta. Can the authorities extend their good work by also seeing to the remains of the Nibbia chapel, which sit in the parking lot of the Evans Building? The fence that surrounds the site has been almost totally destroyed while the once sacred area within has become a dumping ground. Besides being an embarrassing eyesore, particularly since hundreds of tourists pass by here each day, this site is of significant historical value. The few precious masonry remains, including the sarcophagus in which the Italian knight Fra Giorgio Nibbia (1555-1619) was laid to rest, are rapidly decaying as a result of exposure to the elements and neglect. Attributed to architect Romano Carapecchia, this was an unusual chapel in both design and use. It replaced an earlier one which, in 1730, had to be demolished to make way for an extension of the nearby women’s hospital. Below the remains, a sizable crypt is known to exist. Dedicated to Our Lady of Mercy, the new chapel stood next to the cemetery in which countless individuals were buried after succumbing to illness or injury at the adjacent Sacra Infermeria. In fact, the chapel was known as Taz-Zuntier (an old Maltese word for cemetery). During the last war, the Nibbia chapel was damaged (although not heavily) and, in the late 1970s, it was inexplicably demolished, leaving the stumped ruins we see today, ruins that are now obscured by rubbish and vegetation. Following a thorough clean-up and consolidation of the ruins, an idea would be to install a reversible shading device to protect the fragile remains and turn the site into a quiet meditation space just as had been done with a number of blitzed sacred buildings in the City of London such as Christ Church Greyfriars. 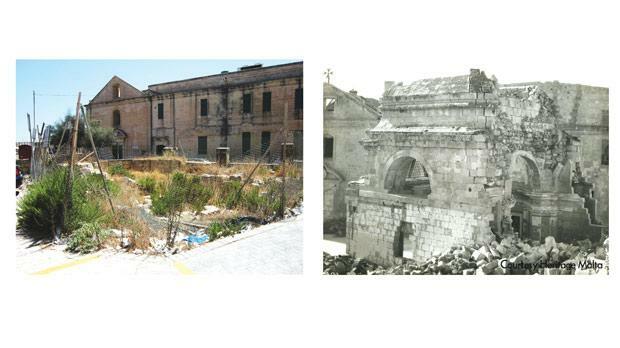 A similar exercise has been carried out by the Restoration Unit in Siġġiewi where the old parish church ruins have been expertly preserved and successfully turned into an archaeological attraction. Incidentally, could the sign erroneously stating “Chapel of Bones” be removed and replaced with a correct information panel? Judge Giovanni Bonello (from whom I obtained the above information) has carried out extensive research and written about the Nibbia chapel. A little known fact is that the actual Chapel of Bones lies underground further towards the Evans Building and, hopefully, one day will be rediscovered, revealing yet another lost, historic landmark of our splendid capital city.